East Passyunk Avenue Business Improvement District (EPABID) presents its 7th annual Restaurant Week! Between Monday, February 25 and Friday, March 8, 2019 feast on a 3-course prix fixe lunch and/or dinner at more than two dozen of our award-winning restaurants for either $15, $25 or $35. From BYOBs to James Beard nominees, experience a diversity of dining styles on one of the “Top Ten Foodie Streets in America.” Special menus cover everything from intimate upscale dining to your favorite pub food, and represent a variety of ethnic flavors, from French and Filipino to Northern European and Italian. East Passyunk Avenue Restaurant Week is your perfect excuse to try something new, return to a favorite, or do both. Follow #EPRW on Twitter and Instagram for last minute and hard to get reservations, even on weekends! 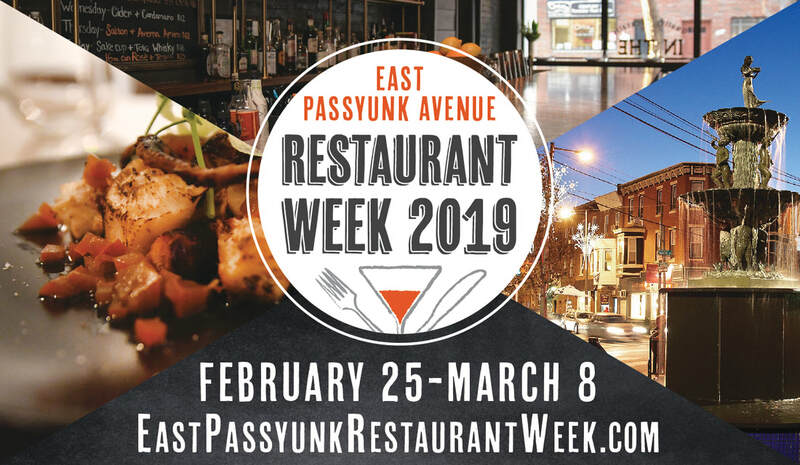 East Passyunk Restaurant Week is February 25 - March 8. Not all menus are offered every day at some restaurants. Click on the name of each restaurant to view their menu, availability and reservation info. All prices are for dinner unless noted. © 2019 East Passyunk Restaurant Week, all rights reserved.